The funnel hole is not obvious unless you see it from the right angle. It's usually off to one side. THIS, btw is why I always wear tall gardening boots with pant legs tucked in when I'm trampling around, and walk around gingerly in sneakers... And never garden in sandals -- the ground is full of spiders, not just these relatively stationary web weavers but free-ranging various ground spiders. The ones on the bushes could also be just crisscrossing safety tethers after a night of hunting, but if they form defined bonnet/saucer shapes, then I think they are probably funnel spider webs. rainbowgardener wrote: ...But all the pictures seemed to be the lawn webbing over holes in the ground. 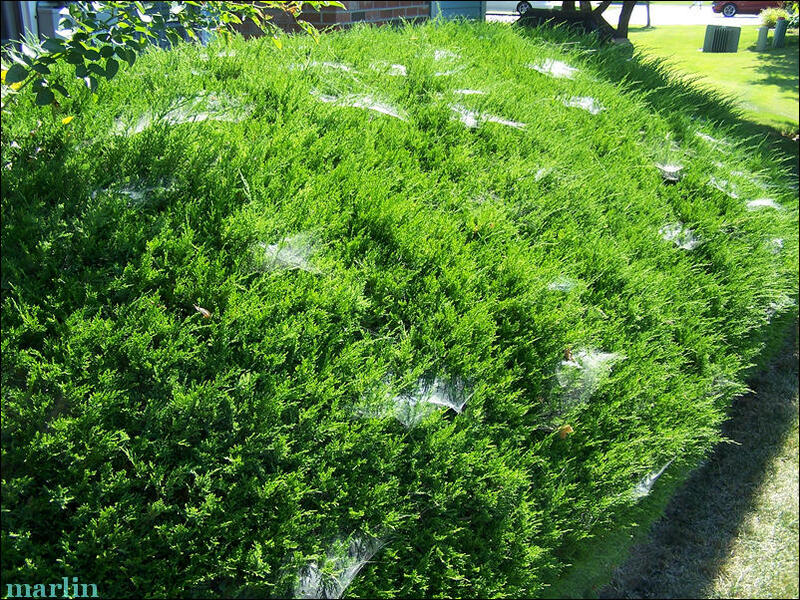 But as shown, I had a bunch of the webbing over top parts of the large shrubs, none lower down on the shrubs. Would funnel spider do that too? The Australian species is, from what I can gather, more like our brown recluse spiders. My husband has horror stories about brown recluse spiders. Your grass spiders (funnel spiders) are benign enough, though you do want to read up on brown recluse spiders and be able to identify them. We have those down here and they are some nasty stuff. Last edited by Allyn on Thu Oct 08, 2015 6:56 pm, edited 1 time in total. Since, I don't really see this happening in where I am. So, you are saying tht the webs are probably always around,you just don't see them because they only visible under certain conditions? Spiders are not bad for the garden, they do eat pests. Until recently the spiders here were mostly large and ugly but harmless but now I think somebody brought in some black widow spiders and the brown recluse came in the storage containers years ago. imafan26 wrote: Since, I don't really see this happening in where I am. So, you are saying tht the webs are probably always around,you just don't see them because they only visible under certain conditions? ... .
That's what I understand, though I've never tested it. I usually ignore webs unless it's covering something I need, so I've never gone to a spot later in the day where I saw a web to verify that it was still there. Somewhere I picked up (I read or someone told me) that you can only see the webs when they have dew on them because the threads are so fine. It may be that the webs aren't literally invisible, but they're probably so inconspicuous without the dew that we don't notice them without close inspection. Thanks, Allyn! That is exactly what I have. And yes, I think the webs are a lot less conspicuous once the dew is off them, but maybe also a bit reduced - some of the very fine webbing dries up and blows away? I looked a little more today and still have not seen any of the spiders, but I haven't really made a good study. Interesting, these spiders are not actually a "Southern critter," being apparently just as common in Ohio where I used to be as they are here. I think we just have here the weather conditions for making them more visible with lots of heavy AM fogs and dews, much more than I am used to. I think they're related to wolf spiders, in that they hide and then jump out to catch prey -- in this case, when something gets caught in the web. Then it retreats back to the hiding place (which is, I think, in the "funnel") to enjoy their meal. So it may be a matter of chance to see one out. Wow! A whole huge flock of starlings just descended on my front lawn and the neighbor's across the street. First time I have seen them. They are walking around dipping their bills into the lawn. Might they be eating those grass spiders? golf ball sized or just a little bigger, very light, hollow. At first I thought maybe some kind of puffball fungus, but the outside is hard/crisp and they all have exit holes, where probably something hatched out. Any idea what it was? some kind of frog or toad. I immediately thought of the galls on my Willow oak, but those are much smaller. Oak Apple Gall Wasps are usually identified by their gall. This very large gall grows up to two inches wide, but is usually golf-ball sized. Apple galls have a thin, papery shell and are spongy inside. They are green at first, turning brown later. Oh, good job, applestar. I think you nailed it! Did I mention I was raking up leaves around the big old OAK tree? Yes, it looks exactly like that. Interesting to know that only one wasp came out of each one. They were so big, I was picturing thousands of spiders or something from each. Your article said they mainly only use southern red oaks or black oaks. I am in the distribution range for both. So you made me so curious I had to go out at midnight and collect a few of the fallen leaves. Don't you love it when you are so right? You not only helped me identify the gall and its wasp inhabitant, you helped me identify what kind of oak tree "I" have (the tree is really in my neighbor's yard, but a lot of its large branches stretch over into mine). I have never seen a funnel spider web before. That picture is fascinating. When we were in Hawaii (Maui & Kauai) there were bugs on the floor of the rental car. The bugs would scurry into hiding when we got in. It gave me the creeps because I knew that the bugs were hiding under the seats. I couldn't wait to get out of that car each time we road in it. I wonder if those bugs were cockroaches. I don't think they were big enough to be 747's. A friend helped me identify the little guy in the second picture above as "American toad," bufo americanus. Oak galls, such as you found, are fairly common and wide spread geographically. Traditionally have been used in some dyeing processes, and IIRC, ink making, and perhaps tanning. thanks, Susan. Very interesting... I learn so much around here! You stimulated me to look it up more. Indeed, used in tanning, very high in tannic acid, and in dying. "the gall formation is a defensive measure by the oak tree and therefore contains strong natural astringent compounds such as tannic acid. 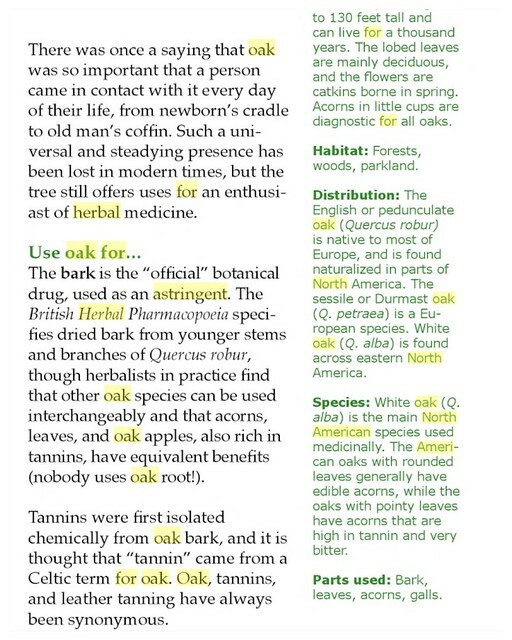 In fact, according to Botanical.com, oak galls are the most astringent vegetable compound in the world. ...Also medicinally, mainly topically: American Indians used poultices of ground gall nuts on sores, cuts and burns ... Recently there has been an interest in using oak galls as a source of natural pesticide, as that is its original function and intent by the oak tree itself. Seems like if you had a container or small plot you wanted to acidify more (e.g for growing blueberries) collecting and grinding up some oak galls would be good for that. Yesterday, I went to a new dentist who supports natural remedies in addition to conventional ones. When I mentioned I usually use tea tree oil and echinacea tincture, plus goldenseal tincture for tooth and gum inflammations, she recommended this product, which uses additional ingredients that I wasn’t aware of, with interesting beneficial effects. The formulator of this formula, Dr. Richard Schulze , says "The Echinacea tincture deadens the pain immediately – when you get it down into your gum line. It also is a surface disinfectant and stimulates your immune system to start working against bacteria that is down in there. The bayberry is one of the stronger astringents, so it will take that gum tissue and literally tighten it right up in front of your eyes. . . . " Oak is also an astringent. "Oh yes, peppermint is a very strong disinfectant, and it’s a very strong circulatory stimulant. 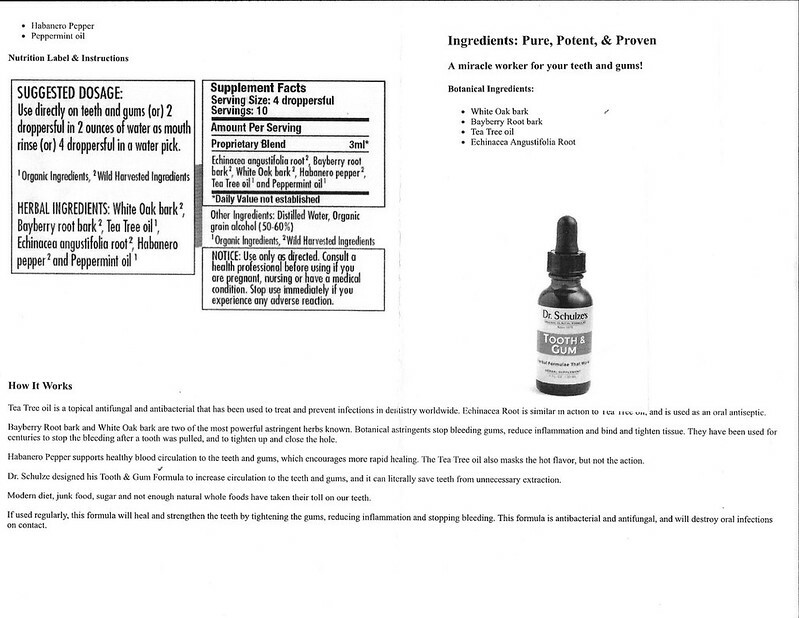 Dr. Christopher even listed it next to cayenne in his School of Natural Healing under circulation stimulants. Peppermint also reduces inflammation, so it’s a great one for curing dental diseases."